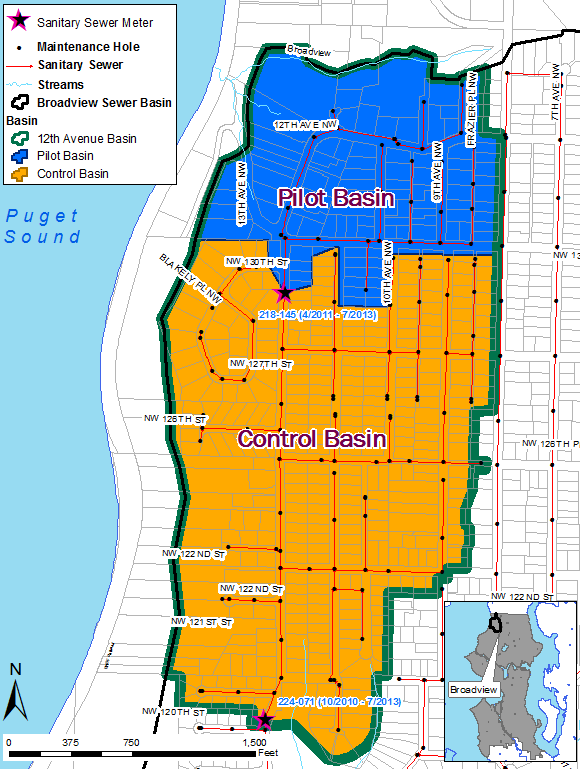 The hydrogeologically complex neighborhood of Broadview in the northwest corner of Seattle, Washington has an aging and undersized separated sanitary sewer system that frequently backs up into the basements of private residences and overflows into the local environment during moderately large rainfall events. Seattle Public Utilities, the local publically owned drainage and wastewater utility, retained Brown and Caldwell to pilot test a sewer rehabilitation technology called Sanipor to assess its effectiveness in reducing groundwater inflow (also referred to as infiltration) to the collection system. Flow monitors were deployed to observe pre- and post-rehabilitation flow conditions in two basins that comprise the 12th Avenue NW system: a pilot basin which was rehabilitated and a control basin which was left unmodified. A SWMM5 model of both basins was constructed and calibrated to both sets of conditions to assess the ability of the technology to reduce peak groundwater inflows during wet weather events of varying magnitudes. A two aquifer approach to modeling the observed groundwater inflow signature was required as the flow data suggested two aquifers may be influencing the collection system in both a rapid and in a longer duration manner. Post-rehabilitation flow data suggested that a groundwater transfer due to the rehabilitation may have occurred between the pilot and the control basins and the two aquifer approach to calibration allowed that shift to be accounted for within the model’s hydrologic parameterization. Long term simulations indicated that the rehabilitation was able to reduce peak 5 min groundwater inflow by 49% on a 1 y storm and 27% on a 25 y storm in the pilot basin, improving the level of service. The long term statistics also indicated that 75% of the water removed from the pilot basin was transferred to the control basin down gradient, reducing the overall project effectiveness in removing groundwater from the collection system. A subsequent hydrogeologic exploration confirmed the two aquifer approach by discovering both a confined and an unconfined aquifer in the project vicinity. The Broadview neighborhood of Seattle experiences frequent wet weather induced sanitary sewer overflows (SSOs) due to its aging and undersized separated sanitary system. Seattle Public Utilities (SPU), the local publicly owned drainage and wastewater utility, initiated several studies to determine the sources of the excess wet weather flow in the Broadview neighborhood. Groundwater inflow was found to be the primary contributor in the observed wet weather sanitary flows (Burke et al. 2012). Through a business case evaluation, SPU determined flood grouting, using Sanipor technology, to be the most cost effective and least disruptive sewer rehabilitation method to reduce the groundwater inflow to the system. A SWMM5 model of the 12th Avenue NW sanitary basin was created to characterize the local surface and subsurface hydrologic and hydrogeologic interactions with the sanitary sewer system for pre- and post-rehabilitation conditions in order to quantify the effectiveness of the rehabilitation pilot project in reducing groundwater inflows. A two aquifer approach to groundwater modeling was employed to properly represent two different groundwater signatures emanating from an unconfined and a confined aquifer, both of which influence the sanitary sewer system. This paper discusses Sanipor technology, the calibration of the SWMM5 model including the use of the two aquifer approach, the unintended consequences of a less porous sewer system, and how modeling in SWMM5 informed the project’s conclusions. The following sections describe the Sanipor rehabilitation technology (Sanipor 2014) and the sewer basin within which the technology was pilot tested. Flood grouting is a process of internally flooding an entire segment of sewer (manhole to manhole) and the side sewers all at once with a two-part liquid grout process that leaches out of the pipe through cracks and defects to seal the pipe, thereby preventing groundwater inflow. The two components of the grout chemically react to create a watertight gel that hardens over the course of a few days. The main perceived benefits of using flood grouting (as compared to pipe replacement) to rehabilitate the sanitary sewer is the ability to unobtrusively rehabilitate side sewer laterals, which are believed to be significant contributors to groundwater inflow and are privately owned past the edge of the right-of-way in Seattle. Two basins within the 12th Avenue NW sewer basin were identified for the modeling effort. The pilot basin to the north is 45 acres (18.2 ha) in area (with 6.9 acres, 2.8 ha, contributing to wet weather flow) and was 56% rehabilitated per measured exfiltration rates of the chemical grout (Burke et al. 2012). A flow monitor was deployed in manhole (MH) 218-145 directly below the rehabilitated basin to measure pilot basin discharges. The control basin, which is 109 acres (41.1 ha) in area (with 19.9 acres, 8.1 ha, contributing to wet weather flow) was not rehabilitated but was continuously monitored by a flow meter placed in MH 224-071. The flow meters were deployed both before and after the rehabilitation of the pilot basin such that the collection system’s hydrologic response to rainfall could be characterized for both pre- and post-rehabilitation conditions. Figure 1 is a map of the sewershed including the meter locations and the delineated project basins that compose the 12th Avenue NW basin model. Figure 1 Project basins area map. The flow data from both locations show two distinct groundwater inflow signatures. A rapid groundwater inflow signature is apparent during large winter storms. The rise in rapid groundwater inflow is proportional to the magnitude of each storm. This groundwater inflow is believed to be the primary cause of sewer backups and overflows in the basin. A secondary long term groundwater inflow signature is apparent in the seasonal rise and fall of the baseline flows during the wet months of the Seattle winter (approximately October through April). Figure 2 indicates the two signatures in the flow data from the control basin’s flow data. Figure 2 Control basin flow data groundwater signatures (blue = meter data, green = rainfall). Capturing both of these signatures in a model is critical for properly estimating the frequency and magnitude of backups and overflows as well as accurately estimating the sizing of capital improvement projects when the model is eventually used for hydraulic retrofit alternatives analysis. Getting the SWMM hydrologic engine to replicate both signatures took some creativity as well as an unconventional setup stemming from some engineering judgment about the sources of the groundwater signatures. The following section describes the hydrologic and hydrogeologic construction of the 12th Avenue NW SWMM5 model (version 5.0.0.22) and how it differs from the standard approach taken in the construction of other SWMM5 models for SPU. The City of Seattle maintains a geographic information system (GIS) database of land surface characteristics, which includes layers such as impervious surfaces, soil types, elevation rasters and existing land use. Sewer infrastructure layers such as pipes, maintenance holes, side sewer laterals, and catchbasins are used to build the collection system in the model and inform assumptions about connectivity to the land surface. Northwest Hydraulic Consultants (NHC) utilized the GIS information in creating three types of model subcatchments: impervious connected area, impervious disconnected area, and pervious disconnected area (NHC 2012). Although the sanitary sewer is separated, some impervious areas within the Broadview neighborhood are connected to the sanitary sewer. In the SWMM model, impervious connected area subcatchments (modeled as 100% impervious subcatchments) route runoff directly to the collection system via a nearby manhole. An example of this type of area would be a rooftop that is connected to the sewer via downspout drains. Impervious disconnected area subcatchments (also modeled as 100% impervious subcatchments) route runoff to the nearby pervious area subcatchments. An example of this would be a driveway whose runoff is routed to a front lawn or garden. The pervious area subcatchment (modeled as 0% impervious subcatchments) saturation excess runoff was assumed to route to the stormwater collection system. A storm outfall was created in the model for all pervious catchments to route runoff. The groundwater engine was activated for the pervious area subcatchments, whereas it was not activated for the impervious areas. In developing the three different land surface subcatchment types, assumptions about size and connectivity (to the stormwater system vs the sanitary system) were made in the Python scripting process. The intent of the Python delineation process was to make a first guess at the condition of the basin. The sizes of the subcatchments were intended to be adjusted in the calibration process once flow data were available to inform the calibration of the hydrologic model (NHC 2012). The City of Seattle adopted SWMM5 (James 2010) for all collection system modeling at the beginning of its Combined Sewer Overflow Long term Control Plan (CSO LTCP). The first step of the LTCP was to construct models for the high priority basins that overflowed most frequently and having the largest volumes. The guidance for the construction of these models called for delineation of calibration basins based on flow meter locations and assigning one aquifer to the subcatchments of that basin. In the vast majority of cases, this method proved to be sufficient in adequately matching the model to observed groundwater signatures of these basins. This approach was first applied to the 12th Avenue NW model in initial calibration but was found to be insufficient in replicating both the short and long term groundwater signatures. The pervious subcatchments would quickly drain their groundwater reserves in matching the peak groundwater inflow and have no water left to drive the long term response. Compounding the issue was the fact that one set of hydraulic parameters (A1 and B1 shown in Equation 1) was insufficient in modeling both signatures without sacrificing the calibration of one or the other. Therefore, an alternative approach to groundwater modeling was required to match both groundwater signatures. The groundwater flow equation (Equation 1) is shown as described in the SWMM manual. The grayed-out parameters are not calibrated in SWMM models for SPU as they have not been found to be useful in model calibrations (SPU 2012). H* = threshold groundwater height (ft). Not much was known about the local hydrogeology at the time of model construction and calibration. No data were available to inform the modeling team of the possible source of the long term groundwater signature in the flow monitoring data. Consequently, a hypothesis as to the source had to be made to inform the hydrologic model’s construction. Inspection of the available hydrologic and elevation GIS data sets indicated an upgradient lake that was identified as being a possible source of long term groundwater. A natural watershed (irrespective of the collection systems in the area) was delineated in GIS from the pilot basin flow meter upgradient, which included the lake. The basin was approximately 300 acres (121 ha) in area, 50 times larger than the pervious area of the pilot basin. Because groundwater tends to flow with the slope of the land surface, this natural watershed was assumed to be possibly representative of the hydrogeologic conditions of the groundwater watershed driving the long term groundwater response. A single new pervious subcatchment with the groundwater engine activated was placed in the model near the bottom of the pilot basin and a new aquifer was created and assigned only to the subcatchment with the intended use of being calibrated to match the long term groundwater signature. Surface saturation excess runoff was routed to the storm outfall in the same fashion as the existing pervious subcatchments in the model. The following sections describe the hydrologic and hydrogeologic calibration of the 12th Avenue NW basin model. At the time of hydrologic calibration, the dry weather flow portion of the model had already been constructed and was not augmented as part of this calibration effort. The pilot basin was calibrated before the control basin was calibrated. Calibration took place in three steps, each isolating a portion of the total hydrologic response. The impervious response was calibrated first as its signal can be lost during the wet winter storms that are groundwater dominated. Following the adjustment of the impervious response was the calibration of the long term groundwater response. This response was calibrated before the short term groundwater response because the local minimums in the hydrograph between storms act as calibration points for the long term response to match. The only response that should be driving the hydrograph to these local minimums is the long term response and dry weather flow. The remainder of the hydrograph is created by the short term groundwater response, which was calibrated last. Impervious-driven storms, where the hydrologic response of the basin to rainfall does not include a groundwater signature, are necessary for the adjustment of the mapped connected impervious area to an effective impervious area within the hydrologic model. These storms typically happen in September and October during the first few short intense storms of fall after the long dry summers. The dry Seattle summers allow the aquifer levels to fall far below the elevation of influence on the collection system (Threshold Elevation in SWMM, H* in Equation 1), thus ensuring that the first few storms of fall lack a groundwater response. Because the pilot project did not affect the amount of connected impervious area to the collection system, any impervious-driven storm in the record (pre- or post-rehabilitation) could be used to calibrate the hydrologic model. Furthermore, because the pilot basin is small and the local rainfall gauge is not located within the basin itself, small differences in rainfall intensity between the basin and the gauge location can affect impervious connected area calibration by providing non-representative rainfall intensities. Such a small basin does not provide much flow attenuation, which renders it sensitive to small changes in rainfall intensity. These two factors lead to greater uncertainty in the impervious connected area portion of the hydrologic model. To address this issue, the chosen calibration is meant to be representative of the majority of storms. Calibration was achieved using PCSWMM’s Sensitivity Based Radio Tuning Frequency (SRTC) calibration tool by adjusting the connected impervious subcatchments’ areas. Figure 3 shows an example of an impervious-driven storm used for calibration. Figure 3 Meter 218-145 meter impervious calibration, July 2011 (blue = meter data, red = model data, green = rainfall). The goals of the long term aquifer calibration were to match both the observed seasonal rise and fall of the basin’s baseflow and the observed minimum flow values between the large winter storms after the short term response has subsided. Not knowing what was providing the long term response from a hydrogeologic standpoint, the setup of the 50 acre (20 ha) long term response subcatchment depended more on modeling technique than real world parameters. Because little was known of the long term response aquifer and there was no information to suggest an alternative setup, the geologic parameters and the bottom elevation from the short term aquifer were applied to the long term aquifer for consistency. Calibration focused on the adjustment of Threshold Elevation, A1, and B1 within Equation 1 as well as the Loss Rate aquifer parameter, which have proved to be the most sensitive hydrogeologic SWMM parameters in Seattle area models. Loss Rate describes the rate at which the aquifer drains to a lower unmodeled area of the aquifer system. It affects the timing and magnitude of the aquifer’s rise and fall during the wet season by dictating the aquifer losses not due to leakage to the collection system. Figure 4 presents the flow data for the pilot basin in pre-rehabilitation conditions. Calibration of the long term aquifer to initial baseflow rise was not possible because the meter was installed in March, which is late in the wet season. Instead, calibration focused on matching the elevated baseflow in March as an indicator that the model was correctly modeling when the first sign of the long term response would have shown up earlier in the wet season. 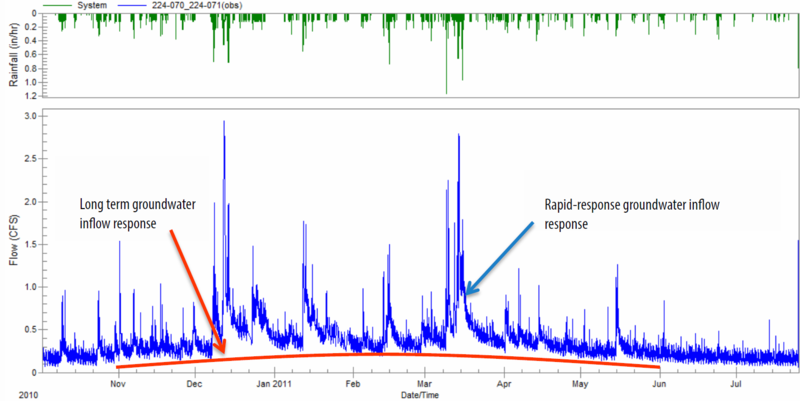 Observable in Figure 4 is that the long term response rises steeply in March after the large storm on March 15 and extends into July. Figure 4 Meter 218-145 flow data, March 2011 to July 2011 (blue = meter data, green = rainfall). After some initial manual calibration to create a partially calibrated long term response, SRTC was employed to make fine-tuning adjustments of the three main parameters together. Loss Rate and B1 proved to be most useful in creating the correct shape of the hydrograph by adjusting its timing and steepness. 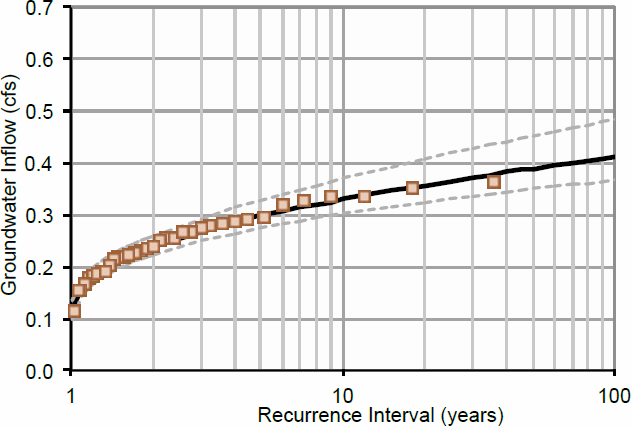 Reducing Loss Rate down to a very small value allowed the aquifer head to remain above Threshold Elevation long into June, which was necessary to match the pre-rehabilitation flow data. The parameters A1 and Subcatchment Area are both coefficients in the groundwater flow equation (Equation 1), so they behave somewhat similarly when adjusted together. Increasing A1 provides a similar change in groundwater inflow response as increasing the subcatchment area, and vice versa, until large adjustments so drastically alter the aquifer volume fluxes that the two responses deviate. Furthermore, adjusting the two parameters away from each other can have a somewhat balancing effect. 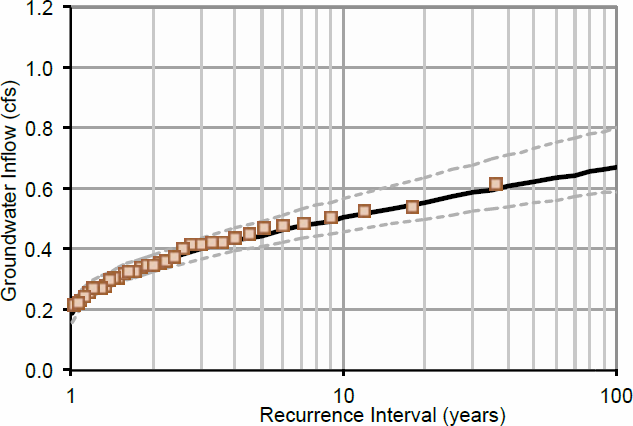 With such a large subcatchment area in proportion to the small amount of baseflow, A1 was required to be very small (A1 = 7.0 × 10−05) in order to not oversimulate the long term response given the large 50 acre (20 ha) subcatchment. While such a low A1 value could indicate that the long term aquifer subcatchment was therefore too large, the large subcatchment ensured that leakage to the collection system had no appreciable effect on aquifer head—a necessary condition to match the observed long term response. As the storms of fall would pass, the baseflow would rise steadily suggesting that baseflow was a function more of antecedent rainfall than of the size or intensity of the most recent storm. To achieve this in the model space, the long term aquifer setup had to ensure that the vast majority of the total flux in the long term aquifer system was through the aquifer itself and not into the collection system, as leakage to the collection system would affect the ability of the aquifer head to rise steadily throughout the wet season. The use of such a large long term aquifer subcatchment and a low loss rate provided the ability to do this. The purpose of the short term aquifer is to fill in the remaining portion of the hydrograph not provided by the impervious response or the long term aquifer. The primary calibration parameters were A1, B1, Loss Rate and Threshold Elevation, which are the same primary parameters used to calibrate the long term response. Initial manual calibration was also used to isolate a range of possible parameter values that could be refined with the SRTC routine. Figures 5 and 6 present the final calibration of the pilot basin model. Figure 5 shows the long term aquifer matching the baseflow in March 2011 and carrying the baseflow through June 2012. Figure 5 Pilot basin calibration hydrograph, March 2011 to July 2011 (blue = meter data, red = model data, green = rainfall). Figure 6 Pilot basin calibration hydrograph, 2011 03 10 to 2014 03 14 (blue = meter data, red = model data, green = rainfall). Figure 6 presents the calibrations to the March 10, 12, and 14, 2011 storms. 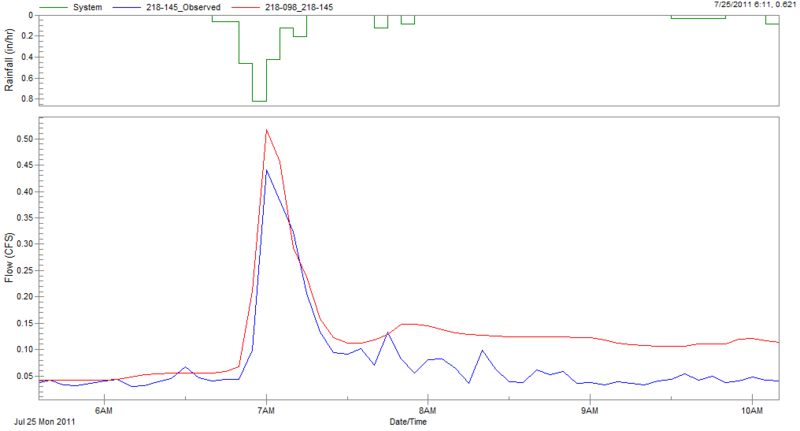 The March 14 storm involved backwater at the meter due to hydraulic capacity issues in the system, rendering the flow data more challenging for calibration than the previous two storms. The lower basin was calibrated using the same methodologies as those used for the pilot basin. The primary difference between the two basin models was the size of the long term aquifer. The ratio of the pilot basin long term aquifer subcatchment to the total size of the pilot basin was 50:1. As no information was available to inform the size of the long term aquifer subcatchment for the lower basin, the ratio from the pilot basin was applied down below to create a 788 acre (319 ha) long term aquifer subcatchment. The subcatchment was split into three 267 acre (108 ha) subcatchments so that flow could be loaded along the 12th Avenue NW trunk in three locations, which was estimated to be more representative of how groundwater inflow likely loads in the field. The calibrated model hydrograph is shown in Figure 7 above the observed flow data. The control basin long term aquifer begins creating appreciable baseflow after the December 2010 storm (an approximately 25 y storm) and continues providing baseflow into July 2011. 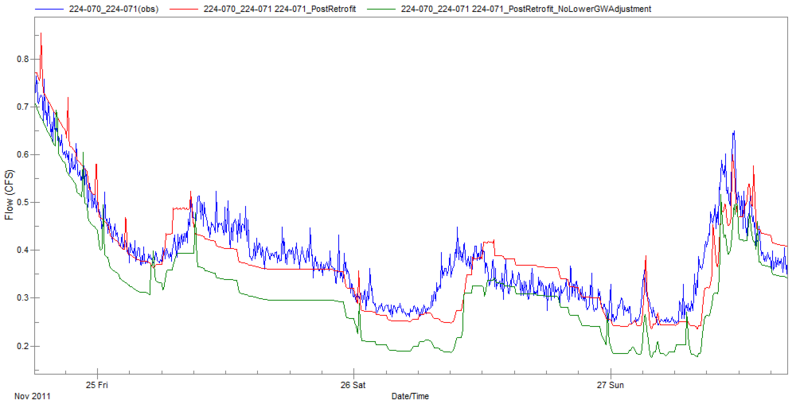 Figure 7 Control basin calibration hydrograph, October 2010 to August 2011 (blue = meter data, red = model data, green = rainfall). The March 2011 storms (Figure 8) show the model’s calibration to impervious-driven storms such as the storms on March 9 and 15 as well as its calibration to the short and long term aquifers, which work in tandem to match the peaks on March 10 and 14. The long term response is creating nearly 0.8 ft3/s (22.7 L/s)baseflow by the beginning of March 14, which elevates the hydrograph high enough for the short term response to match the 2.8 ft3/s (79.3 L/s) peak. Figure 8 Control basin calibration hydrograph, 2011 03 09 to 2011 03 18 (blue = meter data, red = model data, green = rainfall). Rehabilitation of the pilot basin using Sanipor took place in August 2011. All observed storms after August 2011 were therefore deemed eligible for use in post-rehabilitation calibration of the pilot basin model. Figure 9 shows the total observed hydrograph at the pilot basin meter for pre- and post-rehabilitation conditions. It is clear that the rehabilitation made an observable effect in reducing the long term infiltration component of the hydrograph as the rise in the winter 2011–12 hydrograph is not as pronounced as it was in the recorded portion of the 2010–11 winter. Figure 9 Pilot basin pre- and post-rehabilitation flow data (blue = meter data, green = rainfall). The rehabilitation should not in theory have altered the natural hydrologic or hydrogeologic processes of the area. Instead, the only function augmented should have been the hydraulic relationship between aquifer head and groundwater inflow to the collection system. Therefore, recalibration focused solely on adjustment of A1 and B1 in the long and short term aquifer subcatchments while Threshold Elevation and Loss Rate were left untouched. Recalibration of the long term response hydraulic parameters involved lowering A1 while increasing B1 to match post-rehabilitation flow data. This shift suggests that the rehabilitation is most effective at reducing long term groundwater inflow at low levels of aquifer head over the Threshold Elevation and less effective as the aquifer fills to higher levels of head as a higher B1 is needed to drive the inflow response when the aquifer fills. Only A1 needed to be augmented in the short term response to match post-rehabilitation flow data. Its lowering suggests that the rehabilitation was effective in reducing rapid groundwater inflow as well. When the recalibrated pilot basin model was attached to the calibrated control basin model, the total flow created by the combined model was not enough to match the observed data at the outlet of the basin after August 2011 (the rehabilitation date). This suggested that a water transfer between the two basins had occurred as a result of the rehabilitation as the control basin was likely not producing enough groundwater inflow. The discrepancy appeared to be in the long term response as the combined model was able to provide adequate estimates of peak flows during large volume storms but underpredicted winter baseflows. The discrepancy is most pronounced in the low flows between winter storms, as can be seen in Figure 10. The green line is the hydrograph from the combined model, which falls below the observed data. The red line represents the flow created from the combined model after the control basin was recalibrated (described below). 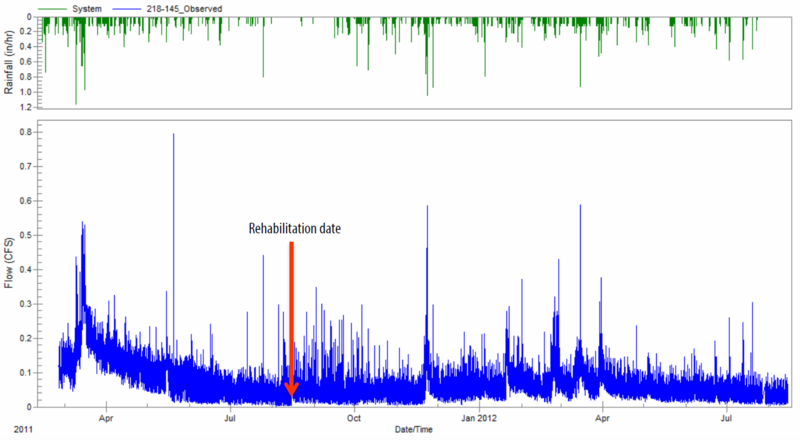 Figure 10 Post-rehabilitation long term response discrepancy (blue = meter data, green = model pre-recalibration, red = model post-recalibration). The hydraulic relationship between the long term aquifer and the untouched control basin collection system were likely unchanged as a result of the pilot basin rehabilitation, so the augmentation of the control basin’s A1 and B1 parameters was not a logical adjustment to make. The hydrogeologic conditions of the control basin were changed by the tightening of the pilot basin’s collection system; however, the parameters Loss Rate and Threshold Elevation were likely unaffected. To match the observed elevated response, the control basin needed more water to drive the aquifer head higher, thus driving wet season baseflows higher. Increasing baseflows was accomplished by adding impervious subcatchments to the model which routes runoff onto the long term aquifer pervious subcatchments. This provides the long term aquifer with more water given the same aquifer footprint (defined by subcatchment area), which drives the aquifer head higher above the threshold elevation, leading to higher long term groundwater inflow. The area of the impervious subcatchments was a point of calibration. The real world analogy to this model space technique is the view that the tightening of the pilot basin has forced water, that would have infiltrated the pilot basin’s collection system, southward, filling the aquifer up faster and higher than pre-rehabilitation conditions. The following sections describe the long term simulation and statistical calculation methodology to quantify the pilot basin’s rehabilitation effectiveness and the rehabilitation’s effect on the control basin’s total groundwater inflow. SPU has operated a network of rain gauges collecting data at 5 m intervals throughout the city since 1976. These rainfall data are used to run 35 y long term model simulations while providing more than a year of model spin-up. Sensitivity testing of the model indicated that at least a year of spin-up time was necessary for the groundwater routine to not be subject to initial parameter estimates. Long term simulation results provide the data necessary to calculate the groundwater inflow statistics of the system in pre- and post-rehabilitation states. Because the Sanipor pilot project’s intent was to reduce groundwater inflow, the Groundwater Inflow time series in the output results file was used to describe the basin’s groundwater inflow behavior. To isolate the groundwater inflow of the pilot basin and the control basin separately, the model was split in two before long term simulations were run. The difference between the pre- and post-rehabilitation models’ infiltration statistics is used to describe the effectiveness and the effects of the rehabilitation project. Table 1 gives the run dates used for the long term simulations. Table 1 Long term model run dates. Two performance statistics were calculated for the pilot basin to describe its groundwater inflow characteristics: peak 5 min and peak 24 h groundwater inflow. The change in peak 5 min groundwater inflow gives an indication of how well the rehabilitation reduces the rapid-response groundwater inflow, which is believed to be causing backups. The change in peak 24 h groundwater inflow is more descriptive of how much total groundwater volume the rehabilitation project can keep out of the system during wet weather periods. This method of rehabilitation effectiveness quantification is defined in the Water Environment Research Foundation (WERF) study (Burke et al. 2012). 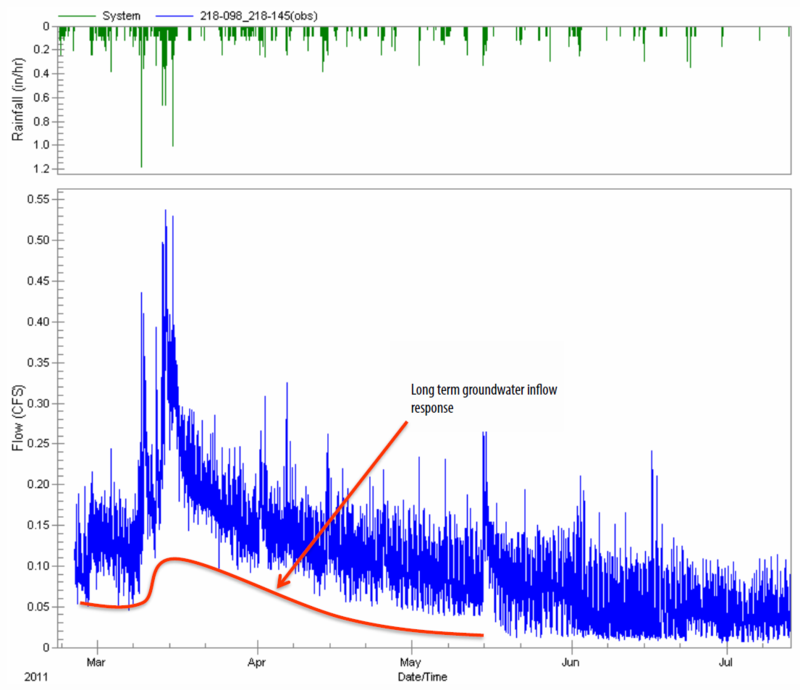 The groundwater inflow time series stored in the model output results files underwent event separation to define wet weather events (at both the 5 min and 24 h levels) that produced groundwater inflow to the collection system. A 24 h inter-event duration was used in all event separations. From those events, annual maximum values were identified and fitted to a Log Pearson Type III (LPIII) distribution for use in estimating peak groundwater inflow values for a range of storm recurrences. 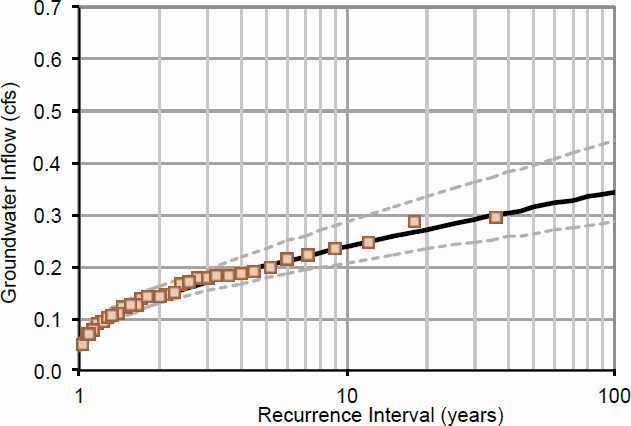 Figures 11 through 14 show the peak 5 m and 24 h annual maximum series from the pilot basin (boxes) plotted on top of the fitted LPIII distributions for pre- and post-rehabilitation scenarios (black lines). Also presented are 95% confidence bounds (grey dashed lines). Figure 11 Pilot basin pre-retrofit peak 5 min groundwater inflow. Figure 12 Pilot basin post-retrofit peak 5 min groundwater inflow. Figure 13 Pilot basin pre-retrofit peak 24 h groundwater inflow. Figure 14 Pilot basin post-retrofit peak 24 h groundwater inflow. Table 2 provides the groundwater inflow summary statistics from the preceding four figures as well as the percentage reductions calculated between the scenarios to characterize the pilot project’s effectiveness. Table 2 Pilot basin groundwater inflow statistics and reduction. The statistics in Table 2 suggest that the rehabilitation project is most effective at reducing groundwater inflow during lower-recurrence storms. With an existing level of service in the basin of around 2 y to 3 y, a peak 5 min groundwater inflow reduction of 33% to 38% can make an improvement in level of service. However, the level-of-service goal for the basin, established by SPU for this project, is 25 y (BC 2014). Storms of this size see around a 27% reduction in peak groundwater inflow, which is still an appreciable improvement considering that not every lateral could be rehabilitated. The statistics describe a similar story for peak 24 h groundwater inflow as well. For a 1 y storm, more than half of the peak 24 h groundwater inflow is eliminated. For higher-recurrence storms, that percentage drops off precipitously with the 25 y storm seeing a 23% decrease in peak 24 h groundwater inflow. These numbers give indication to the reduction in wastewater treatment costs associated with groundwater inflow. For the vast majority of storms (storms <1 y recurrence), the total groundwater inflow appears to be greatly reduced, which will reduce annual treatment costs. The recalibration of the control basin’s long term groundwater signature (described in Section 3.2) indicated that the tightening of the pilot basin had caused a groundwater transfer to the downgradient control basin. Because the groundwater transfer appeared to manifest in the form of the long term signature, a calculation of the change in average annual total groundwater inflow from the long term simulation was made on both basins to compare how much water moved south. Table 3 provides the calculated volumes. Table 3 Groundwater transfer volumes. The average annual total groundwater inflow volumes show that the pilot project was successful in preventing 1 030 000 ft3 (291 664 hL) groundwater water from entering the collection system of the pilot basin. However, the control basin saw a 747 000 ft3 (211 527 hL) increase in average annual total groundwater inflow due to the tightening of the pilot basin rehabilitation. This suggests that 73% of the groundwater that no longer infiltrates the pilot basin is instead moving downstream and getting into the control basin’s collection system. Although the pilot project was successful in removing peak 24 h groundwater inflow from the pilot basin, the analysis detailed in this section suggests that any conclusions about reductions in treatment costs may be moot as the majority of the groundwater still enters the collection system somewhere. Subsequent to the modeling of this basin, Shannon and Wilson (S&W), a Seattle geotechnical consulting firm, performed a geologic and hydrogeologic exploration of the Broadview area to characterize its soils and groundwater. S&W found the existence of two aquifers in the area: an unconfined shallow perched aquifer and a mostly unsaturated deep aquifer confined beneath a till layer of soil. S&W indicated in its summary report that if groundwater inflow rehabilitation projects were to continue in the area, the shallow aquifer water would likely move south and west toward the control basin and ultimately penetrate into the deep aquifer—a conclusion consistent with the modeling effort (Shannon and Wilson 2013). The finding that the confined deep aquifer is mostly unsaturated is consistent with the collection system flow data, which show the long term signature trailing off in the dry season. S&W’s conclusions ultimately provide scientific context to the assumptions made about the hydrogeologic processes of the area. Furthermore, S&W’s work corroborates the understanding of the potential impacts of tightening the collection system from groundwater inflow rehabilitation projects aimed at raising the basin’s level of service. A SWMM5 model of the 12th Avenue NW basin in the Broadview neighborhood of Seattle was created to characterize the hydrologic interactions of the land surface and subsurface with the sewer system for pre- and post-rehabilitation conditions. The pilot technology, Sanipor, was used to rehabilitate a basin’s sewer system from groundwater inflow, which is known to cause sewer backups into private residences and onto the public right-of-way. The flow data for the 12th Avenue NW basin showed two distinct groundwater signatures that required a unique hydrogeologic model setup to replicate. Short and long term groundwater signatures suggested that two different aquifer systems may be influencing the local collection system. Therefore, a hypothesis was made as to the size of the unknown long term aquifer such that wet season baseflows could be accurately replicated. The model was calibrated to pre- and post-rehabilitation conditions. The post-rehabilitation calibration suggested that groundwater prevented from infiltrating the pilot basin had moved south to the control basin. Long term simulations of the pilot basin model indicated that the rehabilitation was able to reduce peak 5 min groundwater inflow by 31% and peak 24 h groundwater inflow by 28% in a 10 y storm. 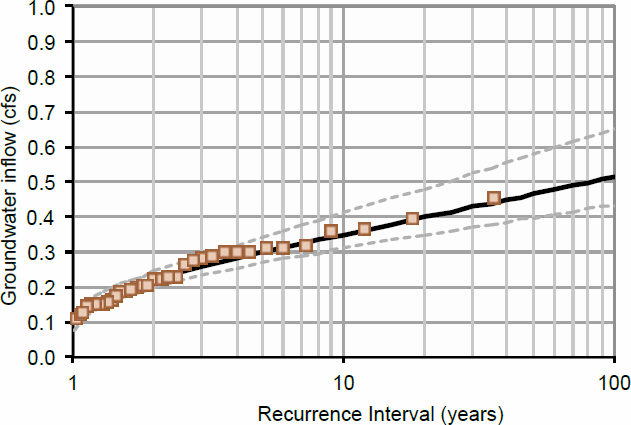 Reduction percentages were greater for lower-recurrence storms, indicating that the rehabilitation was more effective on smaller storms. The converse is also true. The reduction percentages for the 100 y storm are 23% and 17% for peak 5 min and peak 24 h groundwater inflow, respectively. Long term simulations also indicated that 75% of the groundwater prevented from infiltrating the pilot basin due to the rehabilitation now infiltrates the control basin in the form of the long term groundwater signature. This suggests that groundwater inflow reduction projects should be mindful of the influence on the groundwater hydrology and the ease with which the groundwater can move to less porous portions of the sanitary collection system. Brown and Caldwell (BC). 2014. Sanitary Sewer Modeling and Calibration. Seattle, WA: Brown and Caldwell. Burke M., M. S. Merrill, R. W. Jacobsen and H. J. Twenter. 2012. Flood Grouting for Infiltration Reduction on Private Side Sewers. Alexandria, VA: Water Environment Research Foundation. James, W., L. E. Rossman and W. R. C. James. User’s Guide to SWMM5. 13th edn. Guelph: CHI Press. NHC (Northwest Hydraulic Consultants). 2012. Broadview Integrated Model. Seattle, WA: Seattle Public Utilities. Sanipor. 2014. Sewer Rehabilitation Technology. Baden, Austria: Sanipor Vertriebs GmbH. http://www.sanipor.com/what-engl.php. Seattle Public Utilities. 2012. Hydraulic Model Report (Draft), Volume 3: Delridge Longfellow. Seattle, WA: Seattle Public Utilities. Shannon and Wilson, Inc. 2013. Broadview Sewer and Drainage Improvements Project, Data and Preliminary Interpretation Report, 12th Avenue NW Drainage Studies. Seattle, WA: Seattle Public Utilities.